Lamb was not something I ate with any regularity growing up. Over the past few years I have started eating it more often, and have come to appreciate the complexity of flavor it has. The meat is rich, tender, and immensely flavorful. I personally enjoy lamb to be medium rare, so I decided to cook this leg with my sous vide and finish it in the smoker. Alternatively, you could roast this leg of lamb, and still have an amazing meal. 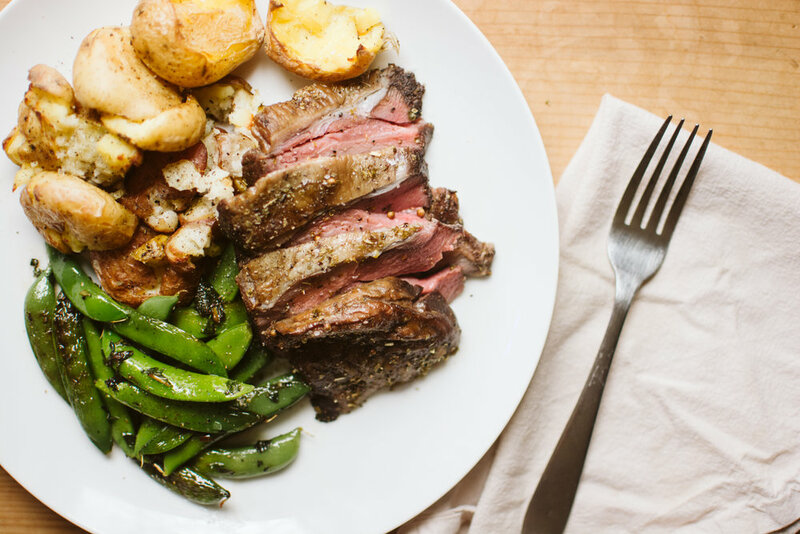 With Easter coming up soon, try to get your hands on a leg of lamb, and treat your family to a meal that is just slightly out of the ordinary. Serve with your favorite Spring sides. For this meal I chose Salt and Vinegar Smashed Potatoes and Minty Snap Peas. Start by filling a large pot with water and setting up your sous vide device, and heat your water to 131℉. Combine mustard powder, salt, and black pepper in a bowl. Rub the mixture all over the meat, making sure to coat the entire surface. Place the leg into a heavy duty sous vide bag, or use two ziploc style freezer bags. Make sure you remove as much air as possible to keep the bag from floating. Lower bag slowly into the water. Then fold the opening over the side of the pot, and clip in place. Cover the pot with plastic wrap to prevent evaporation, and cook the lamb for 24 hours. When the lamb is approaching the end of its cook time, heat your smoker to the 275℉. After the 24 hour cook time, take your lamb out of the water and remove it from the bag. Rub the meat with olive oil and coat with the Oregano and Coriander Seeds. Place the meat in the smoker and cook for 30 minutes. This time in the smoker will help create a nice smoky crust on the outside of the meat. Remove the meat from the smoker and place on a cutting board to rest for 10 minutes. After the meat has rested, slice and serve immediately.